“It’s a proxy war by happenstance,” says Jeff White of the Washington Institute for Near East Policy about the situation in Syria. As if there ever was a pre-arranged proxy war. This was a chess game for two, and had been so for almost half a century. 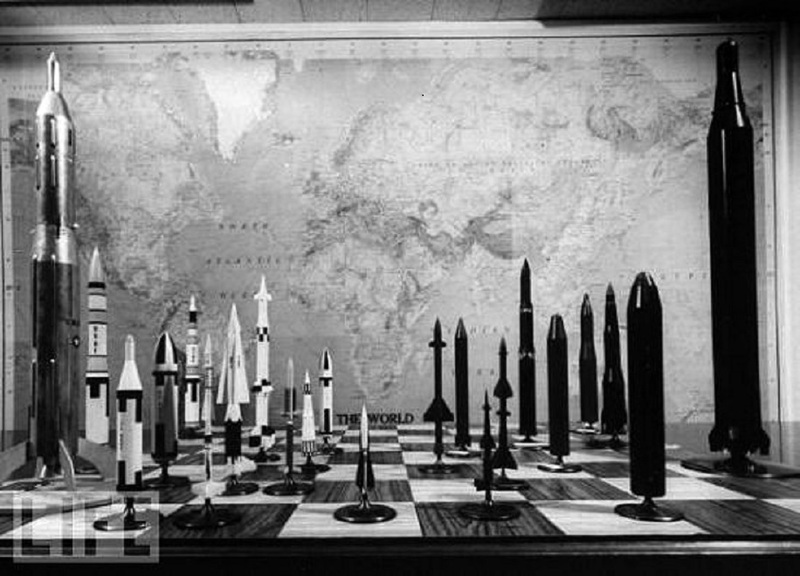 Pawns were being traded between them, but the kings were hiding safely behind their wall of nuclear missiles. Neither would risk open conflict, especially after the crisis of 1962. And the entire world is thankful for that. Except for the countries which played the part of the chessboard in these seven decades. The game is always played in turns. One side intervenes, directly or indirectly, in the affairs of another country. The other side responds accordingly. As long as no more than one side is directly involved, it’s a proxy war and as a friend points out, World War III has already happened, silently, in battlefields all over the world: Korea, Vietnam, Afghanistan, Iran-Iraq and so on. The casualty count of the Cold War rivals, or might even surpass, that of the two formally declared World Wars. Most do not know that immediately following the end of World War II, Churchill had formulated a plan for an Allied attack on the Soviet Union. Thankfully, the rest of the Allies were not keen to continue the bloodshed. The world was divided, the war went on, but in small doses and with various degrees and forms of engagement. And finally, with the collapse of the USSR we thought that the threat of total war was behind us. Until now, that the Cold War seems to be rekindled. But you can only play with fire so much before you risk getting burned. Even by proxy. What Mr. White means is that when the CIA initiated the programme to train and equip the rebels to destabilize Assad, they did not expect that Russia would be directly involved. Is he naive or does he think that the rest of us are? The West is systematically undermining Russia’s allies: first Ukraine and now Syria. Putin was slow or reluctant to act the first time and he could not save the regime in Ukraine. He is obviously not going to let this happen again. Should he let his penultimate ally in the Middle East fall? Would the US do that in his shoes? Assad is a despot, no doubt about it. But so are the Saudis, which are in the habit of crucifying and beheading dissidents. Not terrorists or armed rebels, mind you. Just bloggers. Never mind that, Cameron was all too happy to vote Saudi Arabia for the UN Human Rights Council in exchange for their vote. What we now have is, essentially, an admission that the US and Russia are fighting another proxy war, even if by “happenstance”. Even worse, this “happenstance” is going to continue happening, since the US apparently does not intend to stem the flow of equipment to the “Syrian rebels”, a blanket term that covers also mercenaries, terrorists, and US-trained and armed Arabs from most countries in the region. Continued support of the US to the rebels means, at this point, that the war in Syria will cease to be a coincidental proxy war and will become an intentional one. But what the US fails to realize or purposefully ignores is that the game is no longer played by two. There are many players crowding the board now, controlling different pieces: rebel forces, Assad’s regime, the abortive child of US policy in the Middle East (ISIS), Iran, Israel (which has been itching to attack Iran for years), Iraq, Saudi Arabia, Turkey, the Kurds, Hezbollah, the US (and allies), Russia and even China. This is no longer a game of chess. It is more like children playing with matches in a gunpowder magazine. If ever there was a strong possibility for World War III (IV, if you prefer) to happen since the Cuban missile crisis, this is it. The most alarming fact is that the US defends its policy and intends to continue pursuing it. It insists that the flow of arms is controlled, and it even claims that the plan was to supply the rebels with enough weapons to force Assad to step down, but not for his regime to collapse. So, what is the cut-off point? 100 TOWs? 300? How many rockets stand between Assad’s abdication and his total collapse? How can the US guarantee that the rebels will actually stop fighting, even if Assad does promise to step down? And what if the “moderates” stop and the fanatics continue? How many times does it have to repeat this strategy before it is forced to admit that it never works as intended? Even in cases where the undesirable regime is toppled in a controlled manner, the one that follows is never stable enough to function without support: Iraq and Afghanistan should have proven this point by now. However, Libya is a more likely example for the future of Syria and this scenario is, sadly, the optimistic one. The pessimistic scenario is a large scale, global conflict that will plunge the Middle East and Europe in chaos. If push comes to shove, even the use of nuclear weapons is not out of the question and then the repercussions will be unthinkable. Is this purely a result of short-sighted politics? Is it part of some bigger plan? It doesn’t matter much. What matters is that humanity stands on the brink. War is not a game. It is truly the last resort and by this time in our course as rational beings it should not even be an option at all. The consequences of a modern global conflict are too terrible to imagine. In fact, there is no real need for imagination, as there are plenty of books, films, simulations and videogames that have explored these scenarios. No ideology is worth this. No religion and certainly no economic or geopolitical agenda is worth placing the fate of our entire race in the balance. Not global unification, nor population control. Even putting all sense of compassion and humanity aside, the gamble is too big and the stakes way too high.